Kij Johnson’s 2011 The Man Who Bridged the Mist is a standalone secondary world fantasy. A river divides the Empire’s Nearside from Farside. Bridging the wide river would be challenge enough. The challenge is doubled or tripled by the mist that covers the river. The mist is caustic; it burns. Things live in the Mist, some vast enough to swallow boats and their contents whole. Boats can cross the Mist, but it’s a perilous crossing. Boats disappear; passengers die. Kit Meinem of Atyar has been tasked to build a bridge over the river. Teniant Planner had designed a bridge, but died before he could do more than start construction. A logical choice to replace him would have been his deputy, Jenner Ellar. But Ellar was passed over in favour of Kit. Kit comes from an illustrious family, one that has built much of the Empire’s infrastructure over the centuries. Kit himself has an impressive CV. He has overseen eight bridge projects, whereas Ellar has only supervised three. All of his projects were on a greater scale than any of Ellar’s. So it makes a certain sense to bring him onto the project. Ellar is hurt, as is only natural. Kit feels for him. He will not turn down the job, but he does promise that the bridge will be done, will be well done, and that Ellar will share in the glory. Ellar will have proven that he can handle major projects. His future career will be assured. All that tells readers that Kit is someone who empathizes with others … as is shown in the rest of the book. Constructing the bridge is the work of years. This is long enough that Kit becomes friendly with the communities on either side of the Mist. Long enough to fall for Rasali Ferry and for her to fall for him. Long enough to understand what Kit will cost Rasali’s family (who run a ferry) by rendering their services unnecessary. If Kit were lacking empathy, he would be a happier man. He grieves when his workers die (as some must); he grieves that he is sweeping away his lover’s ancient way of life. It’s odd to read a story that reminds me of family history. The mainland to Cape Breton ferry service was based in Mulgrave, Nova Scotia, hometown to many members of my mother’s family1. The ferry crossed the Strait of Canso. In 1955 the ferry was rendered obsolete by the Canso Causeway. I am not suggesting that crossing the Strait of Canso was in any way as dangerous as crossing the river in this book2. I am not alone in finding this book a welcome change from the usual tales of war and murder more often featured in fantasy and science fiction. 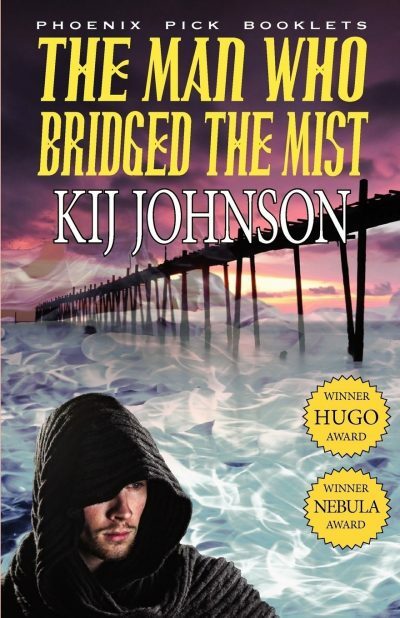 The Man Who Bridged the Mist won Hugo, Nebula, and Imaginaire awards; it was also a Sturgeon finalist. The Man Who Bridged the Mist is available here (Amazon) and here (Chapters-Indigo). 1: Not all members of the family stayed in Nova Scotia after the mid-19th century collapse of the Elgin-Marcy Treaty and the imposition of heavy tariffs. Trade died and close to a third of the town’s population decamped for New England. Of course, because we live in an enlightened era when abrupt repudiation of treaties by tariff-loving nationalists is unthinkable, this is the sort of historical anecdote from which we can learn nothing. 2: Despite which it was (and is) perfectly possibly to get killed out on the Strait. A great-uncle, for example, drowned when he was knocked overboard and his wooden leg proved more buoyant than he was. Several kids vanished into the icy brine while hopping from iceberg to iceberg during the spring break-up. That was a game, not a punishment. I like to think the old traditions live on, along with almost all of the children.